Don’t throw away your water bottles, eat them. 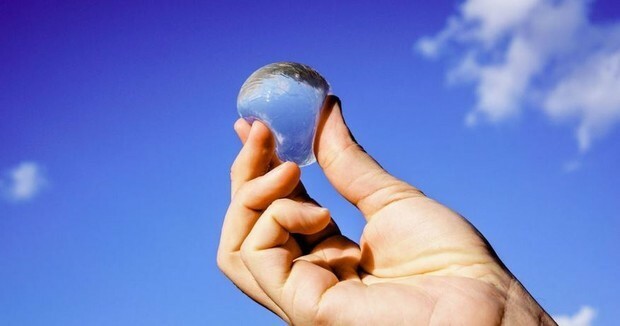 A new start-up named Skipping Rocks Lab has recently launched a new singular product that is supposed to put an end on plastic water bottles usage: they are called Ooho Balls, an edible and biodegradable membrane full of water with the dimension of a little sphere that can be swallowed to stay hydrated. The product composition is simple and brilliant – an ice-cube is dipped into a solution of brown algae and calcium chloride which solidify creating a tiny membrane around it. Then, the ice melt with the result of creating a sphere of potable water. The membrane can be eaten as a whole or bitten for drinking the water, and once it is open it can be closed again soldering it with the lips. The product is already a success, winning the Lexus Design Award and raising £380,000 on a crowdfunding campaign with more than 500 people investing in the project. The mission of this start-up led by three students is to end the usage of plastic bottles, one of the main polluting factor in the planet, and substitute them with an environmental friendly product, useful for events such as concerts and marathons and other “water on the go” occasions. Every year 1 million plastic bottles reach the ocean and their production creates the emission of 300 millions of CO2. Although Ooho balls are brilliant and creative, there are still some doubts about how they can become a product of everyday use. Criticism on the web has been raised; the membrane is too tiny to be carried in a normal bag and it cannot resist the shocks of transportation to the supermarkets. This will probably mean that an “additional package” will be needed. Although the Ooho balls won’t reach their top mission to end the use of plastic packaging, they are still a great achievement for the environment and an achievement that is worth a chance.